The American Medical Association represents doctors in the political and economic arena, but they have a far more important role…attempting to help set the health agenda for millions of Americans. The organization is taking a strong stand warning people about the dangers of too much salt and excessive of sugar in the diet. There is no doubt we consume far too much of each. 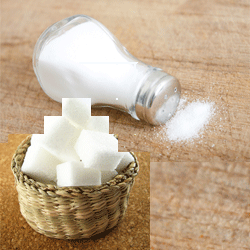 There is a direct link between sodium and high blood pressure, and sugar? Well, it’s everywhere. Sadly, far too much is added to preserve foods, cakes and pies. Expect public service announcements and education over the next decade as the AMA tries to help people make informed decisions; this is much along the lines as the American Heart Association talking about cholesterol.